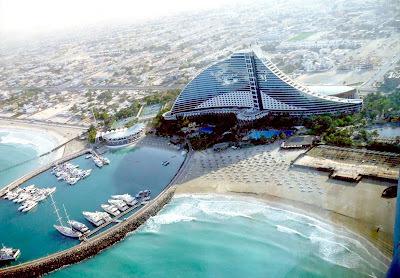 There's been a couple of murmurs regarding the failing infrastructure in Dubai, which has now (temporary) closed the famed Jumeirah Beach due to a preponderance of brown trout. Via Times Online: "A noxious tide of toilet paper, raw sewage and chemical waste has transformed Dubai’s most prestigious stretch of shoreline into a foul-smelling health hazard. 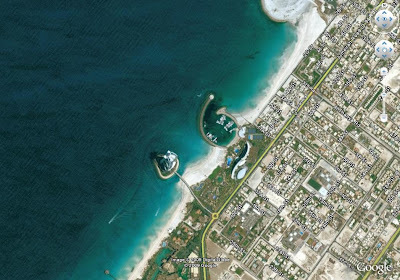 A stretch of the exclusive Jumeirah Beach — a magnet for Western tourists and home to a string of hotels — has been closed." In one of those CSO gone wrong moments, even in a climate that rarely gets big storms, illegal dumping has exacerbated raw sewage flowing into the pristine seas when: "...dozens of sewage lorries carrying human waste from Dubai’s 1.3 million inhabitants emptied their tanks into storm drains such as the one leading to the sailing club. The drains, all connected, were built to carry excess water that falls during Dubai’s short rainy season. " 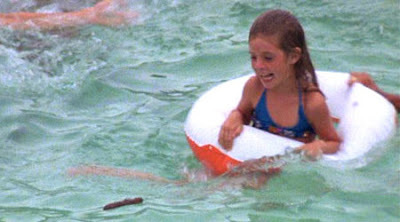 At the risk of stooping to the scatological, one cannot but think of the pool scene from Caddyshack times one million or so... putting a potential dent in the lure of clean, unsullied beaches (and I'm not talking a million Baby Ruth bars here) - something that will need to be addressed in the immediate future, perhaps as development slows somewhat. As Thom Mayne pointed out in October, it's not just the physical infrastructure that will need attention, but social infrastructure as well - transportation, services, and the large disenfranchised population of workers that are building for the rich, but living in squalor at the peripheries of the glitz and glamor. Read more about this and other issues of the development of Dubai in this great article by Mike Davis entitled 'Fear and Money in Dubai' from New Left Review... which includes this choice tidbit: "The unruly voice of labour echoes louder in the deserts of the UAE than it might elsewhere. At the end of the day, Dubai is capitalized just as much on cheap labour as it is on expensive oil, and the Maktoums, like their cousins in the other emirates, are exquisitely aware that they reign over a kingdom built on the backs of a South Asian workforce. "